This print is by Amelia Cleveland and focuses on the history of the LGBTQ community in Grand Rapids. The print is based on two aspects of the local LGBTQ history. First, the Mayor of Grand Rapids in 1988 was Gerald Helmholt, who refused to endorse the first Pride Celebration in this community. 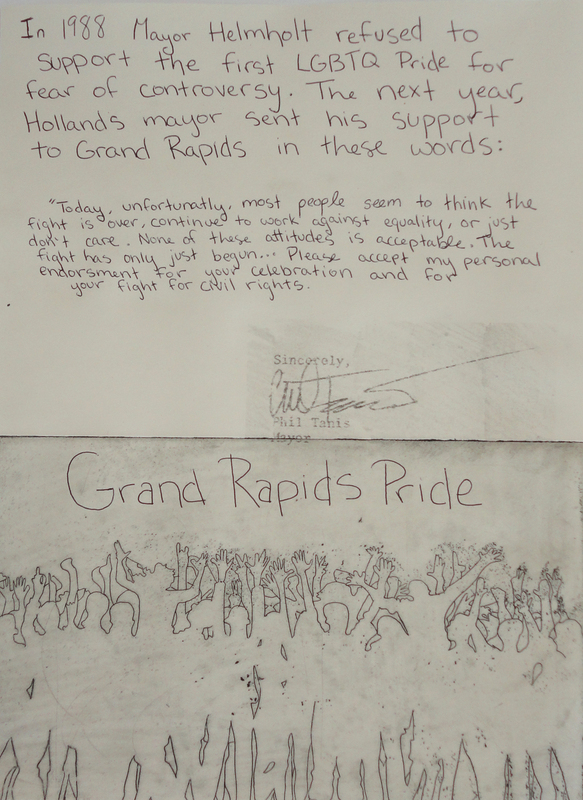 Interestingly enough, in the following year, the Mayor of Holland sent a letter of endorsement of the Pride Celebration in Grand Rapids, even though most people would have considered Grand Rapids to be the more progressive community. The print by Amelia Cleveland juxtaposes these two very different responses from two elected officials in West Michigan. For more details on this history go to this link. This entry was posted in LGBTQ Movement, People's History Artwork and tagged Mayor Helmholt refuses to endorse Gay Pride Day, Pride Celebration in Grand Rapids, the first Pride day in Grand Rapids. Bookmark the permalink.